This sounds like a classic mom-overhype, but it turned out that Cis had met a future star. Still a relative unknown who hadn’t put out an album, a young Madonna auditioned for the part of Virgin Mary in Scorsese’s movie. Given her stage name, it made perfect sense. This story begins a new book of Corman photographs, Madonna NYC 83. Somehow, this lucky photographer got to hang out with Madonna before she released an album, made 12 number one pop hits, landed some 40 songs in the top 20 on the charts, won a slew of Grammys and sold more than 300 million albums worldwide. 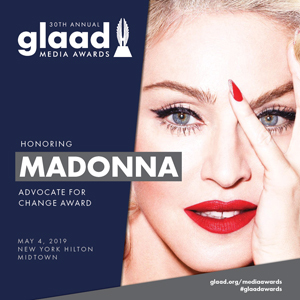 Roughly twice as prolific as Michael Jackson and protean as Prince with her reinvention, Madonna blossomed into one of the most powerful musical entities the world has ever seen. The way album sales work nowadays, she’s probably one of the most powerful the world will ever see. Corman photographed Madonna in various NYC landscapes. She straddles a beat-up red armchair left out on the street. She squeezes comfortably between two well dressed, slightly confused older gentlemen on a bench outside a nursing home. At the time of these photos, the star-to-be favored torn denim, with kind of a James Dean white T-shirt/jean-jacket combo. She sports gaping holes in the knees of her pants, rolled up way past her ankles. She also likes belts. Who needs one, when you can wear three? 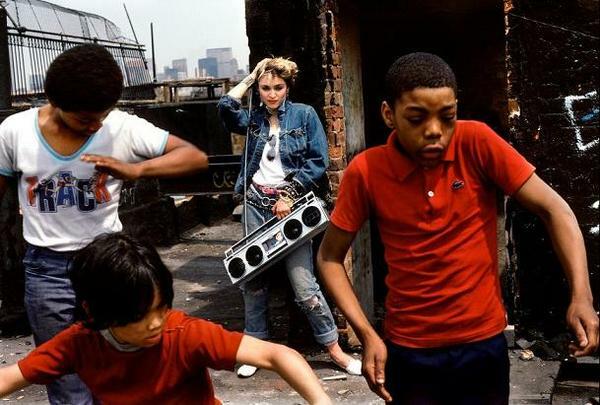 A different series of shots features Madonna in a knit outfit, full of bright blues and reds, posing with a boom box. While some of these poses seem mildly sexual, today’s viewers will hardly bat an eye. In one spot, she munches on the boom box antenna. Madonna dominated radio in her career, and these photos seem to predict future comfort with the format. She’s at ease and also in control. When Corman captures the future star hanging out with a group of five local kids in the 10-to-12-year-old range, the denim comes back out. So does another, more portable boom box. The boys alternate between dancing and looking very serious in front of graffitied NYC rooftops. Madonna stands in the background, saving her moves for the stage. As soon as the kids disappear, she chews on the antenna of this boom box too. When Madonna hits a club to perform, she trades colors and denim for a variation on the downtown NYC musician uniform—a.k.a., all black. (She basically wears the outfit from one of her earliest music videos.) For some additional personal flair, she relies on accessories: a large pair of cross earrings and enough bracelets for the whole band. Not long after these photographs, the debut album Madonna came out. Future works may have sold more copies and won more awards, but they never eclipsed this debut—brash, cheerful, lusty and just eight tracks. Few pop albums achieve this much impact with such few songs. 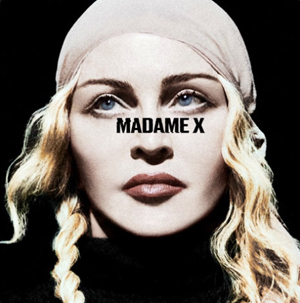 You can put Madonna at the same (high) level as Prince’s Dirty Mind, the Stooges’s Raw Power or Harold Melvin and the Blue Notes’ Wake Up Everybody. From the beginning, Madonna breathed rarified air. In the 1980s, rock, pop, funk, disco, soul, early hip-hop and reggae routinely got mashed together with new, state-of-the-art technology. 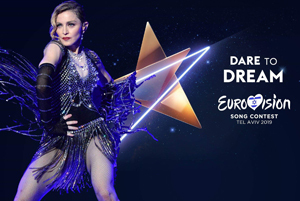 Wild, exciting albums like Madonna proved intensely innovative and vigorously danceable. Bass parts became particularly crucial to the album, clumping and stuttering in bubbly bundles. The producer Reggie Lucas, who spent some time in the early ‘70s touring with Miles Davis before working as a songwriter and producer, “established this mini-Moog bass sound,” according to an interview with The Atlantic last year, even though it was the first time he encountered some of the technology, like drum machines. Madonna seemed to know her direction from the start. The album leads with “Lucky Star.” It’s a statement of purpose, a prediction of what’s to come: “You may be my lucky star, but I’m the luckiest by far.” She willingly let some of that luck rub off on Corman. Next time your mom calls, pick up the phone.